Think of it as the Holy Grail of internet entrepreneurs. That’s what every business online is looking for. 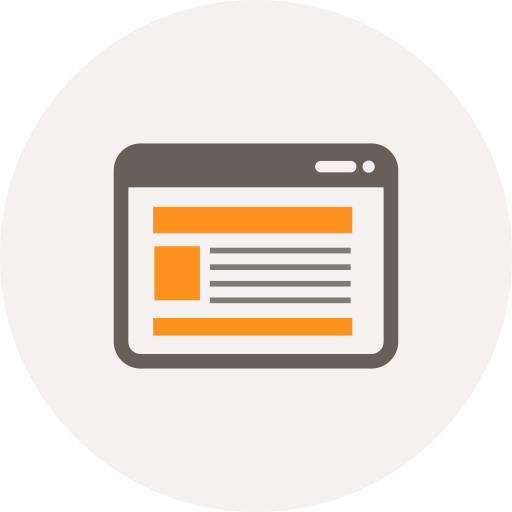 It’s worth noting that 93% of all online experiences began with the search engine. Bear in mind that about 75% of internet users will ignore paid ads and focus on organic links instead. But what do these statistics mean exactly? To put it simply, you have to write content along the lines of what internet users are looking for based on the words that they use to search for information. The keywords that you use can make or break your attempts to attract traffic to your site. According to a 2015 SEO Ascend2 report, the use of the right keyword/phrase is the second most effective SEO tactic. Therefore, your first order of business is to find the right keywords for your niche. You need to find the right combination of words as well as information about their demand. Only then can you move on to create content relevant to internet users. There are plenty of keyword research tools. Here are some that you can use to create a list of word combinations that your audience is looking for. Google is the world’s leading search engine. It goes without saying that search trend statistics collected by the search engine are some of the most comprehensive available. The Google Keyword Planner is, therefore, one of the best keyword research tools available for your use. Unfortunately, it is now restricted to those that have at least one active campaign. 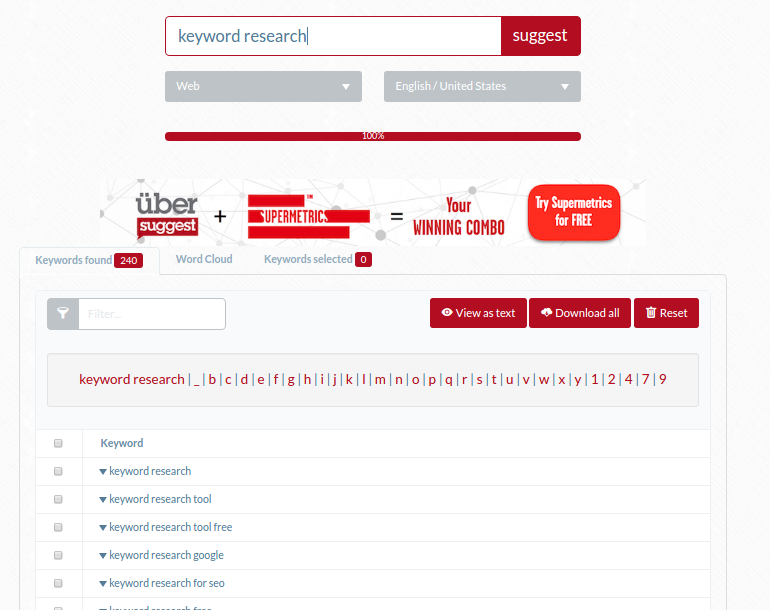 Ubersuggest is a free keyword research tool that you should consider using when doing keyword research. 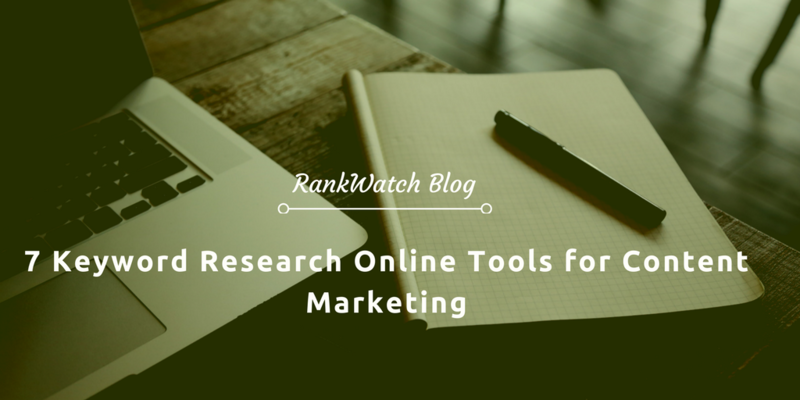 An online research tool is a good option if you have an idea of the words you would like to incorporate in your content, but have no idea of the right combinations to use. So when you input a phrase on Ubersuggest, it will scrape from the web multiple keyword combinations that are commonly used by internet users. This will then provide you with a list of the most marketable keyword phrases you can use to attract more traffic organically. Ubersuggest has several filters that will stand you in good stead. You can use the online keyword research tool to find keyword combinations in multiple languages. You can also use the research tool to determine popular keywords used for different categories such as news, general web surfing, and YouTube among others. The WordStream Keyword Research Tool is an additional free tool that you should take advantage of if you are intent on creating a comprehensive list of popular keywords for your niche. WordStream tool uses multiple sources of information when compiling its keywords. These include search engines, browser toolbars, and internet service providers. It’s worth noting that the WordStream online research tool for keywords has aggregated over 1 billion keywords, making it one of the most comprehensive analytic tools available. You should use WordStream when looking for long-tail keywords. The free version of the keyword research tool will provide you with multiple combinations of the phrase or word you use for search, as well as their relative frequency. The higher the frequency, the more popular that keyword phrase is. Additionally, WordStream has multiple keyword research tools that you can use. These will cover basic keywords you should use, negative keywords you should avoid, keyword suggestions, keyword groups, and keyword niche categories among other things. 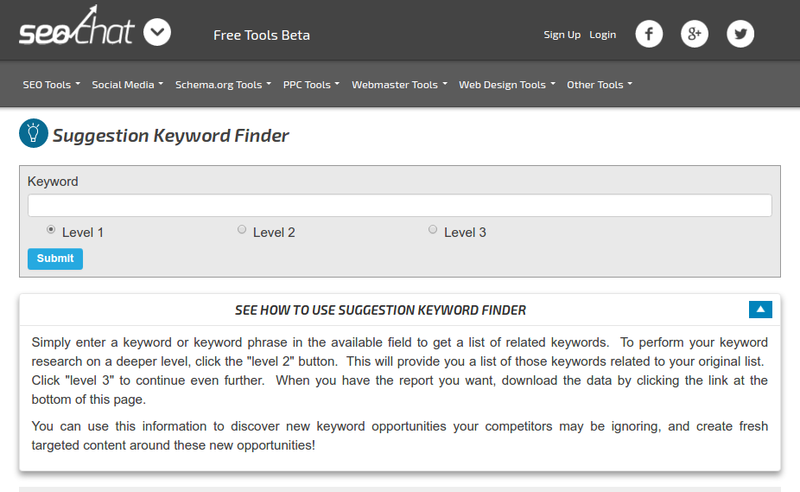 Each of the available free keyword tool variation will provide you with the chance to make 10-30 free keyword searches. Take advantage of the available keyword analytic services and move on. This is a very simple keyword research tool. All you have to do is enter the keyword that you want to search for, press Submit Query, and voila! Level 2 and Level 3 searches provide a deeper insight into the keyword that you have used. You can use these levels to get a breakdown of how your chosen keyword can be phrased in multiple ways. At the bottom of your search page is a download button which will enable you to download a list of all the possible variations of your keyword in an Excel worksheet..
All it takes to start using InstaKeywords is a free user account. Once you log in, you can begin researching on the best word combinations to use for your niche. 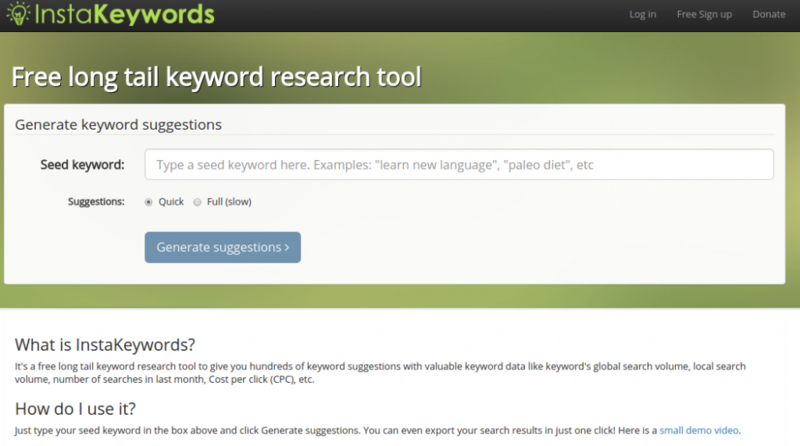 In order to use the online keyword research tool, you need a seed keyword. This is the basic word or phrase related to the kind of content you want to create. Once you input it onto the internal keyword tool search engine, it will generate multiple combinations of that word or phrase. These word combinations are long-tail keywords, which are easier to rank highly for. In addition to long tail keyword suggestions, InstaKeywords will also enable you to access the local and global search volume numbers, the number of the previous month’s searches, competition analysis score as well as the Cost per Click (CPC). You can then export all these details to a file that is usable offline. Once that happens, you can go about creating the right content for your audience, based on the words that people use the most to search for information online. How convenient is that? Keyword Tool performs multiple functions. Once you input a phrase or word, it will output multiple combinations possible. With the paid version, you will also be able to access the search volume, CPC, and AdWords competition if you use the Google product-related filters or other category filters like Amazon. For category filters such as Bing, you will be able to obtain the possible keyword combinations. Another Keyword Tool feature worth exploring is the language-based filter. There’s also a country-based filter that you can use. All these features will help you tremendously, if you are looking to come up with a list of local popular keywords for use in your chosen niche. Remember, the more accurate a keyword phrase is, the more likely you are to attract the right traffic to your website. So how does Wordtracker work? This software requires you to use a Scout browser that is available as an extension. It’s available for Chrome. When active, it will give you access to your competitors’ keywords and keywords from its large database of search terms. 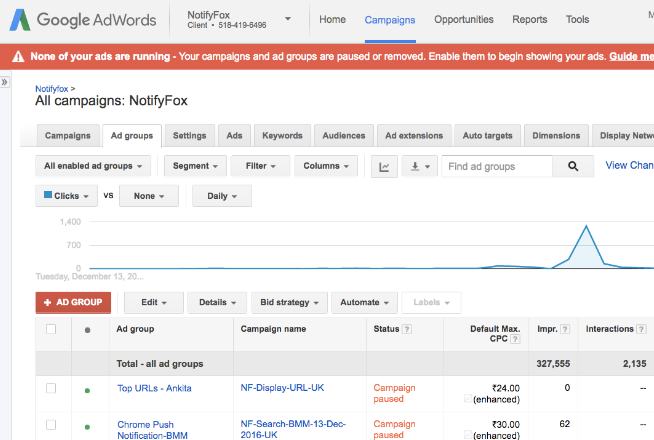 You will also be able to keyword performance metrics at a glance. 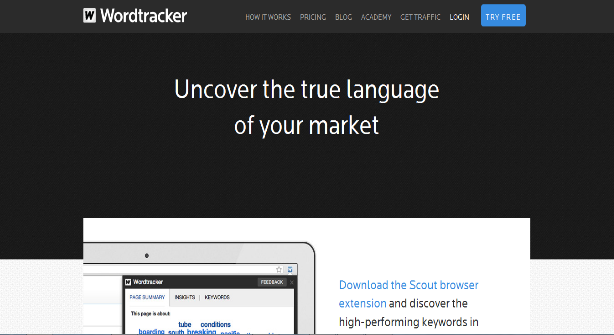 Wordtracker is not a free keyword research tool, but it is affordable. You do however get a head start with a 7-day free trial during which time you will be able to access at least 1000 keywords, SEO data from 200+ territories. 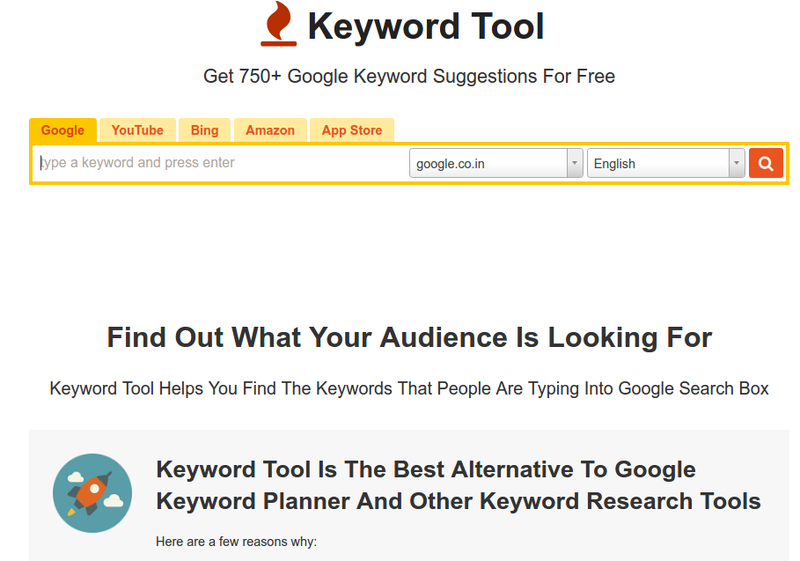 The above keyword research tools are not the only ones that exist. However, they are some of the best and most affordable tools you can use to boost your traffic and enhance your revenue. So use them to your advantage. Navneet Kaushal is the founder and CEO of India’s most award winning SEO Agency, PageTraffic He also works as an advisor and consultant with many large companies. Since 2002, Navneet is a trusted authority in the search engine marketing industry. He helps value-conscious businesses build site traffic increase the user base, and boost web sales and bolster customer satisfaction.